Flaxwood proves that guitars don't need to be made of wood. The CC Custom is happiest in cleaner areas, but the firm's broad range means there's something for all. Intelligent design. First class build. Sustain. Clear, clean tones. Not the most versatile guitar sound-wise. The Flaxwood CC-H CC Custom's body and neck are both constructed out of, well... Flaxwood. Flaxwood itself is a wood-based composite - a man-made tonewood that eliminates the grain structure of the wood. Unusual materials aside, the guitar's electrics are quite traditional. The Flaxwood's dappled brown sunburst gives it a unique look. Flaxwood is a new name in the guitar world, starting in 2006, and grabbing our attention by using synthetic material for their necks and bodies. Flaxwood employs, err, Flaxwood, a material conceived to offer a consistent alternative to good old wood. Flaxwood's construction process involves injection-moulding the body and its separate neck. The material is "a proprietary NFC (natural fibre composite)," explains Flaxwood's Rick Nelson, "containing spruce fibre combined with a polymer binding agent… resulting in a man-made tonewood that eliminates the grain structure of the wood, resulting in an extremely tonally consistent material that's almost immune to changes in humidity." "The backplate of the Flaxwood is designed to enhance the amplified and unplugged sound of the guitar." There's more than a little PRS in the Flaxwood's look, although the top has a more pronounced arch, and the back is virtually flat save for a slight curve over the removable backplate. Undo the five Allen key bolts and pull this recessed backplate off and you can see the virtually hollow-style moulding, with an H-shaped centre block and five protruding lugs. "In fine-tuning the tone, our luthiers came to a resonator-style solution to optimising its sound. The backplate of the Flaxwood was designed to enhance both the amplified and unplugged sound of the guitar," says Flaxwood. While the body is finished in an attractive dappled brown sunburst, the moulded, glued-in neck has a satin black finish that you can just see the raw 'grain' of the Flaxwood material through. The cream bound fingerboard looks like ebony, though it's actually Flaxwood too. The neck feels slightly asymmetrical with a steeper shoulder on the bass-side, a little more sloping on the treble. It's an extremely comfortable, nicely mainstream, 42.9mm in width at the nut, 20.4mm deep at the first fret and 22.8mm at the 12th. With a Gibson-like 305mm (12-inch) 'board radius and a Fender-like 648mm (25.5- inch) scale it feels neither one nor the other. Each of the medium jumbo frets (approx 2.39mm wide x 1.28mm high) is beautifully finished and installed over the binding that's nicely rounded at the edges: careful, classic luthiery for sure. Flaxwood guitars are fitted with a 'self-lubricating' Tune-X Tuning System nut (a system developed exclusively for Flaxwood), a 'shelf' nut whose forward edge sits over the fingerboard, shortening the distance between it and the first fret (it's angled closer to the first fret on the bass-side) and aims to improve lower fret intonation. Like the fretwork it's faultlessly shaped. The back-angled headstock is designed so the strings travel over the nut in a pretty much straight line to the tuners; it creates a relatively small, modern-looking headstock well in keeping with the vibe of the guitar. The material from which it's made may be futuristic and unusual, but the craft appears to be very old-school - an appealing mix. The hardware is much more straightforward, with Gotoh's adjustable wrap-over bridge and height-adjustable locking tuners. At the bridge we have a Seymour Duncan Vintage P-90 and at the neck a 'PCC-90 Candy Bar' - which looks like a cross between a P-90 and the earlier Charlie Christian-style Gibson pickup - designed by Flaxwood's master luthier Veijo Rautia with three blade polepieces and a distinct faux tortoiseshell faceplate that neatly matches the old-school pickguard. These pickups are controlled by a three-way lever selector, master volume (with capacitor and resistor treble bleed network) and master tone controls. The knobs are designed to look like plain black Strat knobs, with a ribbed rubber top for easy adjustment and clear white dot markers for quick visual ID. The Flaxwood has adjustable truss rods, which means that, unlike on some graphite-necked instruments, you can tweak your set-up to add or remove neck relief to your taste. The CC-Custom has a big acoustic ring, feels lively and sits comfortably on the strap. Amplified, what emerges is a very clean, clear tonality. It's not sterile, but instead offers plenty of highs and lows and a snap to the attack that actually leans more towards Fender than a darker, duskier Gibson semi. The difference between the characters of the bright bridge-placed soapbar and the smoother attack of the Candy Bar works well on clean amp tones: the Candy Bar retains that clarity in the mids and lower mids, which does enhance more complex, lower position jazz chords. As we edge up the wick a bit the open, ringing character creates some very usable crunch tones, again more Fender-y sounding and ideal for arpeggiated parts. But there's a lot of high-end, which means you'll have to make some amp or guitar tone control adjustments, especially if you're switching between guitars - the contrast between this and an albeit much lower-priced PRS SE Semi-Hollow with dual P-90s is considerable. So while we lack chewy mids - which makes it less successful for more garage-y classic Townshend riffage - adding those from your amp, or a pedal, does potentially make it quite chameleon-like. Heavier gains? We feel the CC-Custom is less at home here, although the ring and clarity will get you heard. But to our ears this is a guitar for the player who needs cleaner tones: it's very in-tune, with ringing sustain and one of the best modern 'jazz' neck pickups we've heard. Whatever they bring to the tone table, most synthetic or alternative material guitars - historically - have faced a stiff challenge from good ol' wooden axes. 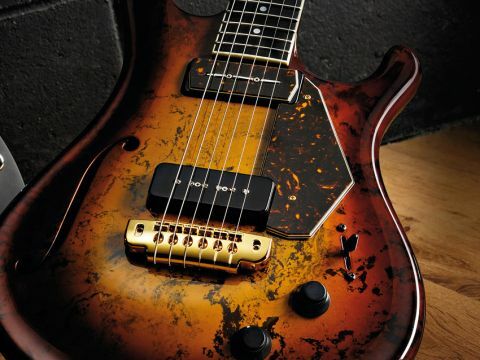 A major reason has been price, and Flaxwood instruments aren't cheap (although Flaxwood debuted a new Hybrid bolt-on neck series of guitars at NAMM 2011, which are expected to be priced around £850). This issue is clearly compounded in these dour economic times. Judged on our review guitar here, it certainly sounds different to similar wooden guitars we compared it with - not necessarily in a bad way, but different nonetheless - yet difference isn't what us guitar players necessarily want. At the moment Flaxwood has no solid UK distribution (though they claim that will change as 2011 progresses), which again impairs their potential progress - you really do need to play it. Despite all these buts we can't help applauding the technical endeavour that's gone into the design and construction of this instrument: the result is an extremely viable guitar with plenty to offer the discerning player who wants or needs to augment their collection.